SCD Group: What does “Post-PC World” mean for Association Management Professionals? What does “Post-PC World” mean for Association Management Professionals? So, the new iPad was announced last week. Yes, I still suffer from iPad envy ... but, that’s not what caught my attention! It's an appliance. It's not for people who like to tinker with tech but for people who want to use it without worrying about how it works, or whether it can be customized or improved by user effort. It's got a multi-touch UI. Post-PC devices have the third-generation user interface -- multi-touch, physics and gestures (MPG). It doesn't have file management. Post-PC devices need updates, of course, but the user doesn't track down the location of files and manage them. When a new app is installed, the user sees the icon, and that's it. There's no drilling down to see all the files installed. There's no file management. Apps function on the app-store model. The post-PC approach to dealing with software is that it's discovered on an app store, downloaded with a single touch and deleted with another touch. In a Reuter’s interview, Ray Ozzie, the man who succeeded Bill Gates as Microsoft Corp's tech visionary, believes the world has moved past the personal computer, potentially leaving behind the world's largest software company. 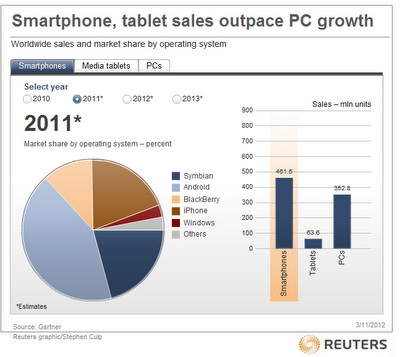 Note that in 2011 sales of smartphones exceeded PC sales. As I noted in a January 29 post “What Do Apple’s 1st Quarter Numbers Mean to You and Your Association. In the 1st quarter (remember, this is just three - 3 - months), Apple sold 73.04 million units ... that is 25.4 million per MONTH! MOBILE units (iPhones, iPads & iPods) represented 88.9% of all Apple sales! So, 9 out of every 10 Apple sales went to a mobile use. Three things this means for associations and nonprofits? Your members (and prospects) are rapidly moving to mobile platforms ... and, they expect their associations, professional societies and nonprofits to be there. Mobile apps are wonderful ... unless ... the app leads them to a non-friendly (e.g., PC-based) website that doesn’t really work well with mobile platforms. If you haven’t already started the process, you should determine the hardware you want in the “post-PC world” ... especially before you purchase new PCs or desktops. So, what do you think? Is your association prepared for the Post-PC world?